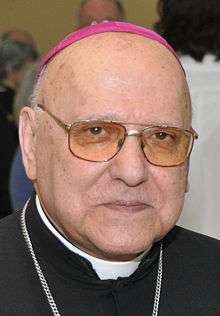 Michel Sabbah (Arabic: ميشيل صباح‎‎; born 19 March 1933 in Nazareth, Mandatory Palestine) was the Archbishop and Latin Patriarch of Jerusalem from 1987 to 2008, the first non-Italian to hold this position in more than five centuries. Sabbah began his priestly studies at the Latin Patriarchal Seminary of Beit Jala in October 1949 and was ordained a priest for the Latin Patriarchate of Jerusalem in June 1955. He was a parish priest for a few years before being sent to the University of St. Joseph in Beirut to study Arabic language and literature. Shortly thereafter, he became director of schools for the Latin Patriarchate. He served in that position until the Arab-Israeli war in 1967. Sabbah then moved to Djibouti to teach Arabic and Islamic studies until 1973, when he began doctoral studies in Arabic philology at the Sorbonne. In 1980, he was named President of the Bethlehem University. In 1987, Pope John Paul II appointed him Latin Patriarch of Jerusalem, making him the first native Palestinian to hold the office in centuries. From 1999-2007, Sabbah was the International President of Pax Christi, a Catholic organisation promoting peace. Sabbah has also spoken in support of Palestinian rights, the two-state solution and the Palestinian refugees' right of return. He has criticized the West Bank barrier and called for an end to the Israeli occupation of the Gaza Strip and West Bank including East Jerusalem. In 2006, Sabbah was one of the signatories of the Jerusalem Declaration on Christian Zionism, which repudiates Christian Zionism as inconsistent with Christian teaching. Sabbah resigned as Patriarch on 19 March 2008, after reaching the age of 75, the age of retirement. Sabbah is currently the Grand Prior of the chivalric Equestrian Order of the Holy Sepulchre of Jerusalem, one of the knightly orders founded in 1099. On 11 December 2009, Sabbah together with other prominent Palestinian Christian leaders launched the Kairos Palestine Document against Israeli occupation. Wikimedia Commons has media related to Michel Sabbah.